Bush meat hunting has recently become a controversial issue from the perspective of conservation in the central African forest region, since it allegedly depletes wildlife, resulting in what is termed 'empty forest syndrome'. Reliable data on bush meat hunting and trading are, however, not yet available. In order to provide the basic data for ensuring sustainable livelihood hunting by the local inhabitants, preliminary research was conducted on bush meat hunting and trading in Northern and Eastern Provinces of Cameroon, particularly in the areas around Benoue National Park and the proposed Boumba-Bek and Nki National Parks. The preliminary survey and on-site education were conducted in the Deng-Deng area in Eastern Province, and Garoua, Tcholire and other areas around Benoue National Park in Northern Province, where YASUDA Akito, a graduate student of ASAFAS, is planning to begin research on the relationships of the local people with the nature conservation projects. We also visited Malea Ancien, a village in Yokadouma District, Eastern Province, and had discussions with HATTORI Shiho, another ASAFAS student staying there, on her ethnobotanical research on the Baka hunter-gatherers. She is particularly interested in the process of acquisition of knowledge regarding forest plants and in variations between individuals on such knowledge. 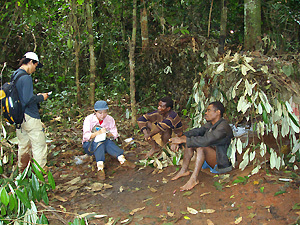 In addition, we spent a few days at the Ndongo Field Station, and had talks with Prof. SATO Hiroaki of Hamamatsu University of Medicine and Dr. YAMAUCHI Taro of the Graduate School of Medicine, the University of Tokyo, who were conducting nutritional and physiological studies on the Baka hunter-gatherers, on various problems concerning the research and maintenance of the station. In Garoua, Northern Province, we met Dr. Assan Gomse, Conservateur at MINEF, to get information on conservation activities in Benoue National Park and its surrounding areas. Upon our return to Yaounde, we visited the regional office of CIFOR at Nkolbisson, and met Mr. Tieguhong Julius to inquire about its activities, and possible cooperation with us concerning the livelihood of the forest peoples in Cameroon. Other persons we met during our stay in Cameroon included Dr. Mathias Heinze, a GTZ (Germany) officer responsible for the Eastern Region, and Dr. Daou Veronique Joiris of the Department of Cultural Anthropology, ULB, Belgium, both of whom are specialists in the social aspects of forest conservation. 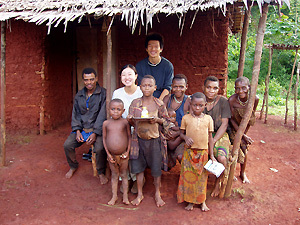 Research and educational activities in Cameroon have been greatly enhanced by the establishment of the Field Station. There are two ASAFAS students currently carrying out field research in this region, and three others are planning to visit Cameroon for field research in the latter half of FY2004. The Field Station is also being used by researchers and students from other Japanese universities, such as Hamamatsu University of Medicine, the University of Tokyo, Kobe-Gakuin University, Yamanashi Unversity, and Toyama University, and serves as a joint research base for these researchers. We hope to further strengthen the function of the field station, which is such an important research base in Cameroon. We also maintain cooperative relationships with conservation-related organizations in Cameroon, and plan to hold a workshop on the forest peoples in the proposed national park areas in the latter half of FY2004. The workshop is being jointly organized by the Kyoto University Cameroon Field Station, MINEF and WWF-Cameroon, with the participation of researchers from University of Yaounde I, GTZ, National Herbarium and other related organizations.